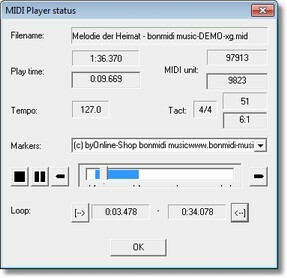 Download GNMIDI demo from https://www.gnmidi.com/gnmidien.htm. Choose MSI installation for simple installer on your Windows computer. Alternatively a zip package is available if you want to use GNMIDI without installation. More information about installing can be found at https://www.gnmidi.com/gninstallen.htm. Start the application from the Windows menu or desktop icon . Use menu operation File/Open and choose the folder and file where your song is located. Press Ok to load the song into GNMIDI. Full shows information about the song. Middle a splitter divides the window into upper and lower half. The upper contains information the lower contains karaoke lyrics. Karaoke shows karaoke text (and optional chords lines). During playing synchronized text is colored when active and scrolled into view. After opening the file the menu items and toolbar items are activated when a function can be applied to this song. If more songs are opened then the active window in front is the active song with its possible menu and toolbar functions. 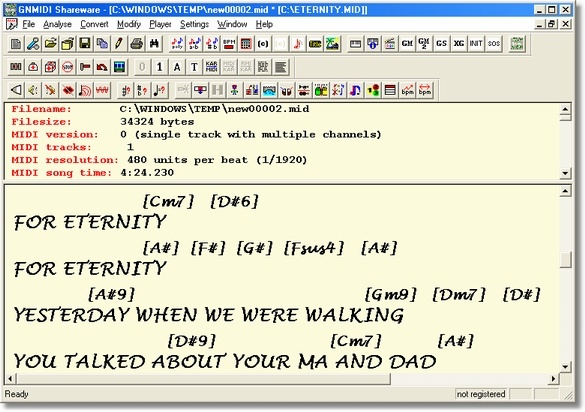 If no song is opened then the menu items are active which can be applied without need for an open file. Some of them are batch operations where you are first asked to choose a source folder and a destination folder. The operation is then applied to any song found in the source folder and results are put into the destination folder (with same folder structure as in source folder). The batch operations can also be found in the menu File. Activate the song by clicking with left mouse button on the window title of the song. Press space key to play this song with internal player. Stop the player again using space key. With keys TAB and BACKTAB you can jump forward and backward during the playing. Open a MIDI file and choose an operation that you want to do. Example: mute the melody channel that you can play the melody self with accompaniment by MIDI. Start the operation mute voices using the menu Modify/Volume operations submenu (or using the toolbar icon ). The mute voices dialog will appear where you are asked to choose one or more MIDI channels that will be muted. We will use method delete notes so that the channel still contains the sound information which can be used when playing the melody self on this channel. Click OK button to start the operation. A temporary MIDI file will be generated that contains the modifications. Also a Window with information about this window will be displayed. Play the modified song to test if the changes are as wanted. You need to save the result if you want to keep it otherwise it is only temporary and will be lost after closing the window or application. Use File/Save as menu operation to write the result to a new location or name. Use File/Exit to leave the application. The program will warn if you haven't saved files and allows to decide about saving/ignoring/cancelling exit. The program will remember your recent used files and settings that you have changed. 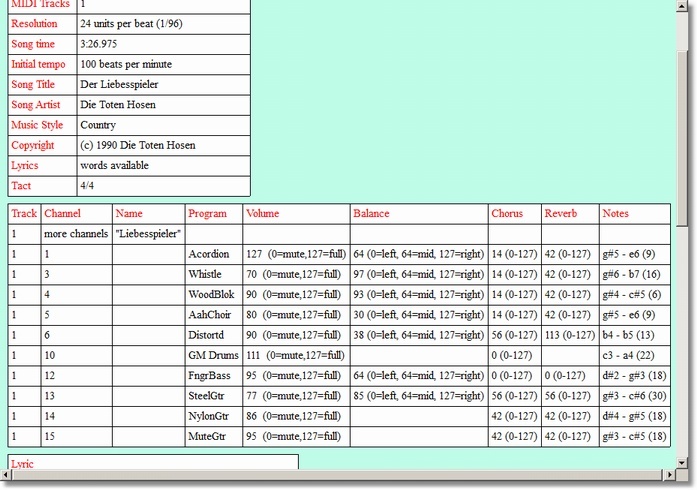 The demo limits some operations which are removed if you order and install a GNMIDI license. Please order a GNMIDI license if you find GNMIDI useful for your musical work.